English began to reassert itself as a national language between the twelfth and fifteenth centuries due to a variety of influences. Previously English had little or no status as a language because of the dominance of the Normans from 1066 (Crystal 2004). A triglossia was present where English was used in the most informal domain particularly by the lower classes while Latin was the language of the formal and written domains such as that of the church, administration and law (Crystal 2004:128). French was spoken by the nobility in formal domains (Crystal 2004:128). English therefore lacked prestige. However during the Middle English period the status of English rose as a result of a variety of factors. Firstly in 1204 Normandy was lost in a war with France (Baugh Cable 1993: 128). As a result the English and French nobility separated and had to choose between dwellings in England and France especially as the king of France Louis IX took the land of nobles (earls of Warenne, Arundel, and Leicester) who had dwellings in England (Baugh Cable 1993:129). Consequently the need for the French language as a medium of communication was lessened as the ties to the French people were less strong. (Baugh Cable 1993). French became the language of the enemy and the English language united the nation because of the war. 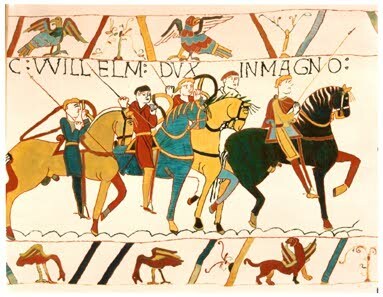 The loss of holdings in France such as Normandy allowed the status of English to rise since the people had less need to use French (Baugh Cable 1993). Similarly due to his mother’s connections in France, Henry III caused his subjects to unite and to express their identity by using English (Baugh Cable 1993). Henry III was fascinated with the French which resulted in him favouring and rewarding French nobles by placing them in positions of high responsibility to the extent that it appeared he didn’t trust his native subjects in positions of responsibility (Crystal 2004, Baugh Cable 1993: 133). As a result of Henry III’s behaviour an “anti-French” feeling grew which caused people to express their hostility to the foreigners by speaking English (Bragg 2003). English began to rise as a national language as it expressed identity in a period where there was an influx of foreigners (Baugh Cable 1993). Additionally the Hundred Years’ war (1337-1453) and the bubonic plague helped English reassert its status as a national language (Fennel 2001). The Hundred Years’ war took place as a result of Edward III claiming the French throne (Baugh Cable 1993). French became the language of the enemy so people reverted to English to distance themselves from the French and French culture especially as the French eventually won (Baugh Cable 1993). Many holdings in France were lost therefore French was no longer significant as a language (Baugh Cable 1993). Additionally Edward III conquered Wales and Scotland and so English was used to expressed an identity (Baugh Cable 1993).